has spent at least 8 weeks of the year in Croatia since he was a child. Even as a child he fished with local fishermen and thereby learned about traditional Croatian fishing, such as night fishing for lignje (squid), parangal (longline), panula (live bait trolling) and nocturnal spearfishing..
IThen, in 1998, he bought his first boat. After demonstrating initial success in the big game fishing on that boat, in 2003 he upped his game even further and purchased a bigger boat. Since then he has devoted himself exclusively to big game fishing for bluefin tuna, swordfish and shark. Patrick Baier has a skipper license for the open sea and all the necessary licenses for bluefin, swordfish, amberjack and albacore. Blue and thresher sharks are protected and released when caught. The magazine Kroati.de says: "Patrick Baier is an indispensable part of the Croatian big game fishing scene." has known the North Dalmatia region for over 10 years. She is very familiar with the country and people and is available as a contact to share her experience in all matters. She also organizes and guides visitors on the spot in our "Ladies First Program". is a professional fisherman, apnoe diver and a spear fishermen. He knows the region like no other and reliably leads the team to the fish time after time. Over 20 years of experience in big game fishing off the coast of Croatia. An experienced skipper and big game guide. His main target are tuna and his second passion is jigging for amberjack. Decades of long experience in big game fishing especially on tuna. With more than 20 years of experience in big game fishing, he is a professional fisherman and previously a spearfisher. He therefore knows the underwater world like no other. His favorite methods are jigging for amberjack, drifting for blue fin tuna and panula fishing for dentex. A young but very experienced skipper, Sale on his own prefers to panula fish for dentex and palometta but also has a lot of experience with tuna. And he has proven this often enough with our guests. New to the team since 2016, he is an experienced assistant and big game guide and loves panula fishing. He can also be booked as a guide for the new rental boat, the Bayliner Trophy..
Over 45 years experience in big game & saltwater fishing (Atlantic / Red Sea / Indian Ocean / Pacific). Several records: IGFA, Europe, Kenya, All Africa, Great Britain. Experienced guide & tour leader. Besides saltwater, one of his other passions is cooking. 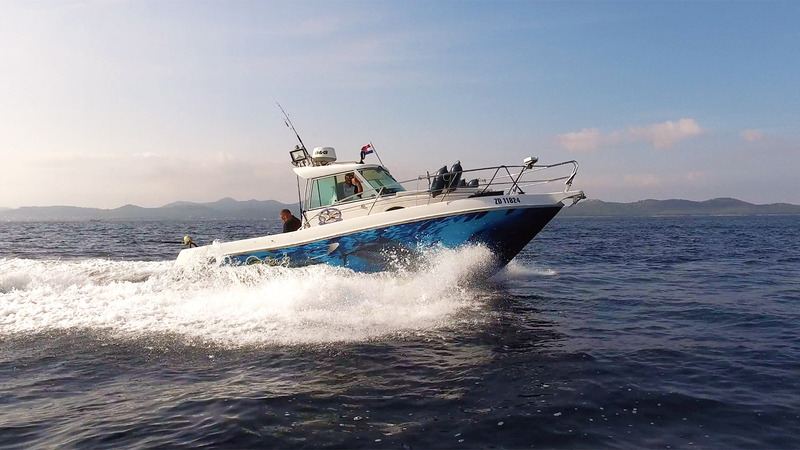 We have 4 big game boats at the base in Zadar and 1 boat in Sibenik. We offer full-charter, big game fishing tours for bluefin, swordfish, amberjack, dentex, leerfish, dolphin fish (mahi-mahi), false albacore (little tunny). Our fishing techniques are: drifting, popping, jigging, slow jigging, bottom fishing, trolling as well as traditional live bait fishing for amberjack and dentex depending on the season. We are fully equipped with tackle, guests do not need to bring their own equipment. The charter price includes the cost of the crew, diesel, fishing licenses and soft drinks. We have a limit for bluefin and can catch one specimen with more than 30 kg per trip, thereafter we "catch and release" or "tag and release". The best months to fish for bluefin and swordfish are July to October. Bluefins then have an average weight of 50 kg. But there are some fish underway weighing more than 100 kg. The rule on board with us is safety first. The catch remains the possession of the boat. Are you traveling with your spouse (and possibly children), who may not be very interested in big game fishing? We have already planned for such circumstances and offer a varied and interesting alternative program parallel to the fishing tours. Refer to the section "Ladies First" below. If you have any questions or suggestions, just send us an e-mail. You can reach us at 00385-989249181 during the season or 0049-1788069669 any time of the year. Tuna fishing / trolling / spin fishing / jigging / slow jigging on 31 ft. TIARA open, 10.9 m. long, 3.85 m wide, 2 x 300 PS Caterpillar diesel, radar, 2 fishfinders, tuna tower, outrigger, combat chair, live bait tank, Sardamat, electr. downrigger (2019), rocket launcher for up to 8 rods (casting / jigging) in the bow, fully-equipped galley with stove, fridge, oven, microwave. Air conditioning, TV, PC. Wifi / WLAN antenna. 4 berths. Boat Crni Tic (Tuna Bird), based in Sibenik for bookings of 2-3 days but Zadar is also possible 8 meters long, 2.80 meters wide, 3500 kg driven with a 150 hp shaft drive diesel, the boat has a cruising speed of 15 knots and top speed of 20 knots. The boat has a toilet, radar, fishfinder, scanner, stern commander, cabin, an additional highlight is a Minn Kota engine which enables perfect panula fishing or over wrecks. Skipper Damir works exclusively on the boat. When you fish with us, you will only use high-quality tackle brands such as Shimano, Daiwa and Penn. We are fully equipped with rods and reels from 20-130 lbs stand-up and trolling. We also have jigging rods in PE 3-10 as well as high-quality stationary reels, such as Shimano Stella, Daiwa Dogfight , Shimano Saragosa. We also have popping and spinning equipment, as well as bottom fishing / slow and inchiku jig fishing equipment. This means you do not have to bring an extra tackle and can save the extra costs on the plane. Seit 04/2016 geht unser Selbstfahrerboot an den Start. Damit geben wir Anglern, die auf eigene Faust angeln möchten, die Möglichkeit, tage- oder wochenweise ein Boot zu mieten. Sardinen könnt Ihr über uns beziehen und zwar ca. 20-30% unter den Preisen auf dem Fischmarkt. Das Boot ist eine Bayliner Trophy 6,40m x 2,50m mit einem 115 PS Aussenborder, 2 Takter der neusten Generation Optimax Merury. Der Motor ist sehr sparsam mit unter 25 Liter/Std bei Marschfahrt von 18 Knoten. Top Speed macht das Boot 22-26 Knoten ja nach Beladung. Tackle ist auch vorhanden und bereits im Mietpreis enthalten: 2 mal 50 lbs Ruten mit 50er Rollen Shimano und Okuma, 1 mal 30 lbs Rute mit 30er Okuma , 1 Jigging Kombi PE 3-5. Weitere Ausstattung: Ein Sardamatic Automat fürs Anfüttern, Kampfstuhl, Gaffs, Kartenplotter und Fishfinder und Westen. Do You Have Questions? Would you like to contact us? Just use the form below. We'll get back to you.